Young Tiger Jr NTR is turning out to be minimum guaranteed hero in overseas. Irrespective of talk, his films are doing well in the region. 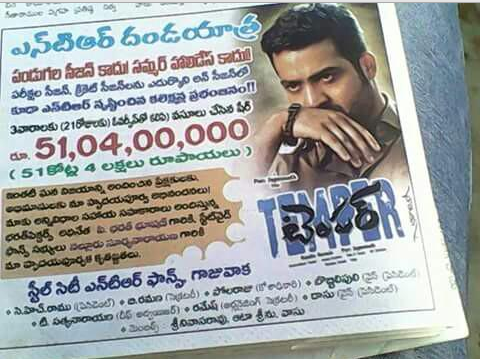 We have already reported that NTR latest film Temper directed by Puri Jagannath has crossed $ 1 Million mark. This is second million dollar earner for NTR after Baadshah. Nandamuri fans are in jubilant mood with success of Temper in Overseas and started comparing Jr NTR Temper with Pawan Kalyan successful movie Gabbar Singh. Foreign trade reports suggested, Temper has surpassed the Gabbar Singh full run shares in USA. As per trade reports Temper is likely to be placed in Top 3 movies in overseas. But repeating the same in domestic market can be impossible for NTR. NTR has entered the club of Telugu heroes in USA to have two films with million dollar revenue. While Mahesh Babu tops the list with 4 films (Dookudu, SVSC, 1 Nenokkadine, Aagadu), Pawan Kalyan (Gabbar Singh, Attarintiki Daredi) and NTR take second position with 2 films each.